Comprehensive review of Art Naturals Soleil Sunless Tanning Lotion. See what real experts and actual users have to say about this self tanning product. I gave this self tanner a 2.25 out of 5 ranking. Art Naturals Soleil Sunless Tanning Lotion is a gradual self tanner. So after one application I wasn’t happy with my tan, it wasn’t nearly dark enough. Also, the tan produced a yellow tan on my skin. I think it looked really fake and not natural. This one smells good, fruity and tropical. It dried in average time, and it was easy to apply. So besides, the color, there were some things that I liked about this. If you’re looking for a gradual tanner you may like it, but I think it will only work on certain skin tones. 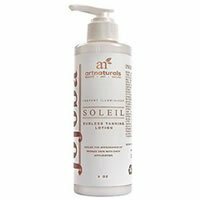 Art Naturals Soleil Sunless Tanning Lotion comes out a thick, white lotion. It kind of resembles sunscreen when it comes out of the bottle. It’s one of the thicker lotions out there, and is very emollient feeling. Since there’s no guide in this self tanner, a tanning mitt isn’t absolutely necessary. They do provide a really nice, high quality mitt with the product, and they also provide a tiny finger mitt to apply to your face. While I do appreciate the mitts they provide with this lotion, you don’t necessarily need them to apply it. But nonetheless, the mitts are nice. Applying this one is pretty easy. I used the mitt because it came with it, but I actually think it may even be easier to apply this one without the mitt because it’s so thick. The product blends in pretty nicely, and it doesn’t turn white on your skin. This self tanner dried in 30 minutes, and after it dried my skin felt very silky. It has jojoba oil in it, so maybe that’s what contributed to my skin feeling so soft. I think this one smells good. It kind of smells like tanning bed lotions. It‘s fruity and tropical smelling. I can smell a tiny hint of something bad though, maybe DHA or a cardboard type smell. It smelled good until the next day. The cardboard smell was still slightly there, but I think the fruity smell overpowered it. This is definitely a “buildable” tan, and not one where you’ll see results after one application. After only one application I had a very, very light tan. Also, my tan wasn’t very natural; it appeared yellow on my skin. I didn’t like the shade it produced, as it wasn’t a brown color, it looked fake. You’d need to apply this one a few days in a row if you want a medium or a dark tan. On the bottle this does say it’s buildable, so this is a gradual tanner. Art Naturals Soleil Sunless Tanning Lotion only lasted about 1 day. But that was only one coat, if you apply it daily, it’ll last longer (maybe another day or two). This may work for some skin tones, but on me it looked yellow. Art Naturals Soleil Sunless Tanning Lotion is only $12.95 per ounce and only $1.62 per ounce. That’s super cheap. To buy Art Naturals Soleil Sunless Tanning Lotion, Click Here. Drying Time It took 30 minutes to dry. Smell (Before) Smells pretty good, fruity and tropical. Smell (After) Smelled good until the next morning. Color Produced I got a very light, yellow tan. Price It’s only $1.62 per ounce.